Includes Psalms, Hymns, and Antiphons "Dixit Dominus" [17.03]; "Cantibus organis" [5.24]; Laudate Pueri" [16.24]; "Valerianus" [6.03]; Laetatus sum" [17.16]; "Nisi Dominus" [3.03]; "Lauda Jerusalem" [3.34]; "Jesu corona" [7.50]; "Magnificat" [9.40] with brief connecting antiphons and chants as assembled for the original 1721 performance. Recorded in 5.1 surround sound utilising the DSD system before a live audience in the First Congregational Church, Berkeley, California, USA, 18 April 2004. Recorded in 5.1 surround sound utilising the DSD system in the First Congregational Church [no live audience], Berkeley, California, USA, 20 April 2004. Susanne Rydén and Dominique Labelle, sopranos; Ryland Angel, counter-tenor; Michael Slattery, tenor; Neal Davies, baritone and chanteur. Notes in English, Français, and Deutsch. Photos of the artists and performance. Complete texts and translations. Reproduction of manuscript autograph page. Nicolas McGegan is capable of astonishing feats of music-making. His Hungaroton recording of Telemann�s opera Der Geduldige Socrate (tragically out of print) is one of the finest recordings of anything ever done, certainly one of the outstanding opera recordings of the twentieth century. Alessandro Scarlatti at his best achieves that ecstatic, thrilling energy in the high Baroque style that Bach achieved in parts of his b minor Mass; and this music, even in the very first number, Dixit Dominus, is among Scarlatti�s very best. The elaborate almost delirious contrapuntal choruses and their dialogue with the soloists is truly exhilarating. Scarlatti, like Bach and practically no-one else, could create a musical edifice by weaving two � or three � independent, seemingly unrelated, melodic lines together; indeed Scarlatti was more daring than Bach at times. When one of them is a voice and one an instrument, the effect is stunning, especially when they play in extremely close harmony at the extremes of their range. * This performance is everything one could ask for, the chorus is precise and full of life, the soloists sing tunefully, accurately and with commitment. The energy of the music is so high level I found I couldn�t listen to the whole concert at one sitting, but needed to rest a day in between halves. The brief antiphons are welcome, but do not work out so well as a would a full slow movement between high energy allegro movements, as in, say, the three movement Vivaldi concerto form. And, this music which reaches forward as well as back to mix high Baroque and Gregorian chant shows us that Scarlatti, at least as much as Bach, deserves to be acknowledged a transitional composer, makes Bach sound very "Classical," even a bit stodgy, by comparison. Recording is accurate giving full definition to soloists against each other and each against the chorus, in the SACD surround tracks both side to side and in depth, with all musicians in the front of the hall, the chorus behind the soloists. This is a live recording, and contains a few moments where a soloist might have sounded a little better given a second chance in the studio with a good editor, but here it is as it was. Audience noise is all but non-existent except for applause before intermission and at the end. We are now coming to a situation of incompatibility between two systems of surround sound. The familiar one we know from recordings of films, where there are three front channels � right, left, and centre � and two or three rear channels � right, left, and perhaps centre as well � has been joined by another system which is often now used for classical music recordings (e.g., DG and, apparently, Avie). This system is: centre front, and right side front and side, and left side front and side, where the side speakers are placed at or just slightly behind the listening position. This recording sounds to me as though it is mixed in the side speaker surround system. This system is more practical for small listening rooms, or rooms where the listening position is a sofa placed against a wall of the room, and was indeed recommended as long ago as the 1970s for listening to SQ quadraphonic disks. Surround sound recordings mixed for side placement of surround channel speakers do not sound as realistic when played back with rear placement of surround channel speakers. Packages should be marked as to which speaker placement is recommended, and perhaps there will be double issues of the same recordings in both systems. It isn�t reasonable for recording companies to expect people to move their surround speakers to different positions from recording to recording, or to switch between two separate systems, that is a total of eight speakers, two of which are disconnected all the time. Some modern and classic sound sources (e.g., my new Sony DVP NS 755V DVD player, and my classic Aphex Systems AVM 8000 processor from the 1970s) can be adjusted so as to create virtual extra speakers and allow the use of more than six channels all the time; presumably these systems accomplish the shift from one system to the other automatically. A practical compromise for persons such as myself who have a rear arrangement of surround channel speakers is to disable the rear centre channel, if any, and move the listening chair back against the wall so the rear speakers are indeed nearly beside us. Ideally this should also include readjustment of the speaker distance settings in the sound source equipment. Another approach would be to listen to the 2.0 channel SACD tracks through a fake surround sound processor, and this might give you the best sound with your system; you will have a pleasant surround sound ambience, but with no depth definition in the ensemble sound. This is a beautiful recording in every way, no matter how you listen, and since there is no actual musical information in the surround channels, only ambient information, it is worth a little fiddling with things to get it to sound its best with your equipment. 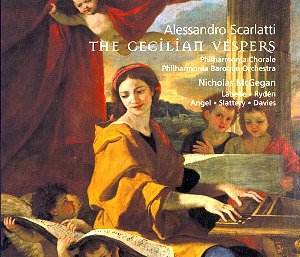 *Handel learned a lot from Scarlatti, and turned this trick only once that I know of, in his Ode for St. Cecilias�s Day. (string bass), and the church acoustic was boomy as it was. surround channels, this was angled at the requisite +110/-110 degrees. producer/engineer/mastering teams, all with different sets of ears.